My friend Jana helps me behind the scenes with this blog. She formats a lot of the printable recipes and grocery lists that readers loves so much. I often send her last-minute pleas for help and she always delivers. I appreciate her so much. 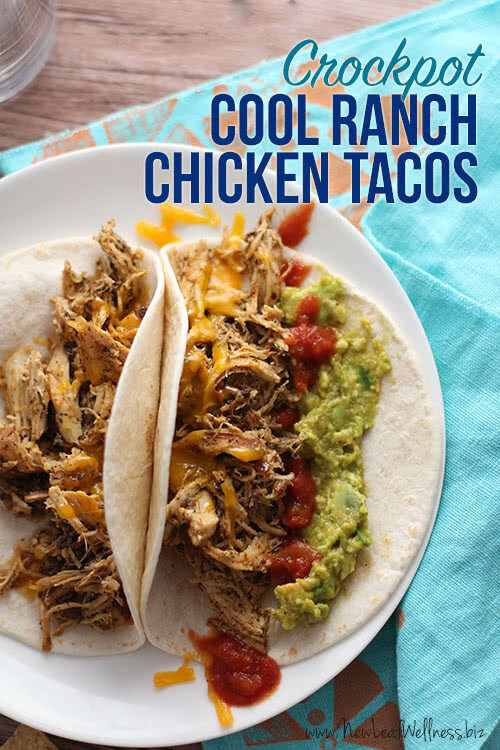 Jana knows my recipe style very well so I was super excited when she sent me an idea for Cool Ranch Chicken Tacos. My recent blog post with homemade ranch and taco seasoning packets immediately came to mind and I got to work. The final result was DELICIOUS and my husband loved it so much that he ate all of the leftovers for lunch. The combination of dill from the ranch seasoning and heat from the chili powder and red pepper flakes in the taco seasoning can’t be beat. 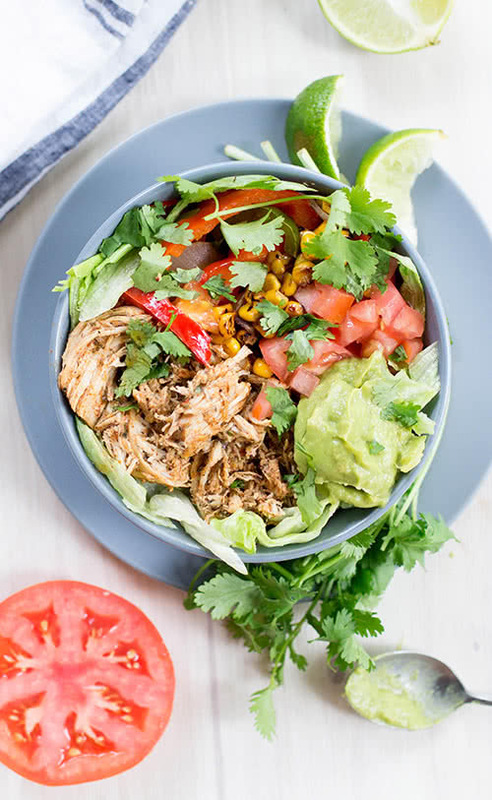 Such a fun twist on chicken tacos, Friends. Enjoy! Cook fresh or freeze and cook later. 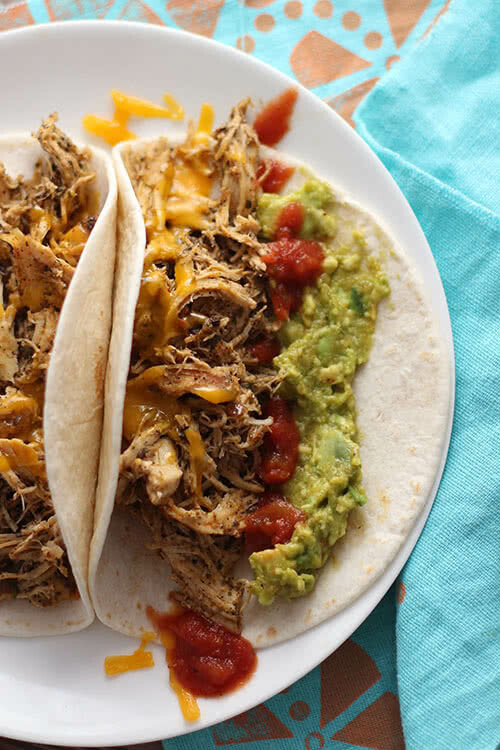 Serve on soft tortillas, rice, or lettuce with your favorite taco toppings. Combine all ingredient in crockpot and cook on “low” setting for 6-8 hours. 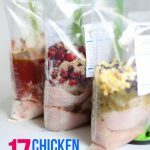 Shred chicken and mix with sauces and spices left in crockpot. 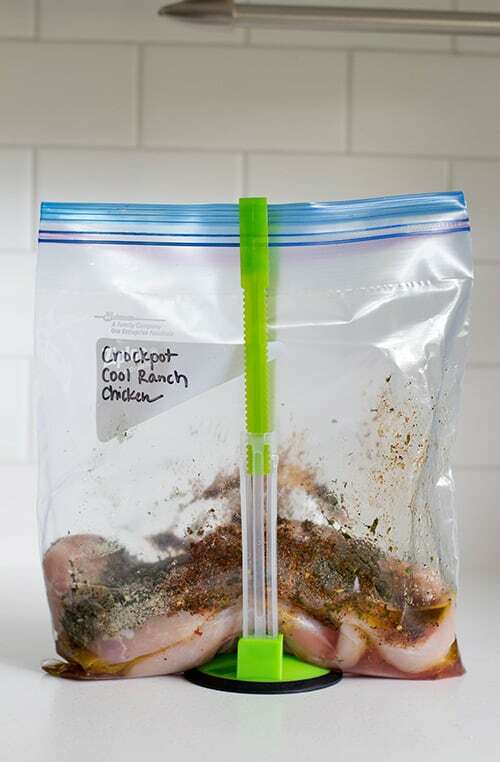 Combine all ingredients in a gallon-sized plastic freezer bag and freeze for up to to three months. When ready to cook, thaw overnight in refrigerator or in morning in water. Love, love this recipe!!! By chance do you have nutritional information? No, I’m sorry but I don’t. At this time I’m only able to calculate the nutritional info for the recipes in my cookbooks because it takes me FOREVER to do. Sorry about that, Joy. If you enter the link in my fitness-all it will almost instantly calculate the nutritional values. Very easy. I’m curious about the liquid requirements of an electric electric pressure cooker. Did you add any liquid? Mine says to use about a cup of liquid. No liquid needed in the crockpot. 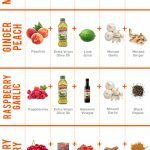 Do you add liquid if your putting it in an instant pot? Was there ever an answer to whether additional liquid was needed when using an Indtant Pot? You should always use a liquid in a pressure cooker or Instant Pot. I would do about 1/2 a cup of water per pound of chicken. If you are only using it to cook the chicken to shred later and not add in other ingredients, use the trivet that’s included and put down 1/2-1 cup of water per lb of chicken and cook 9 min on high pressure with natural release of 10 min to make chicken shreddable. 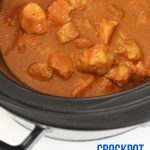 sorry if this sounds like a silly question but I’m still new to using a crockpot. After it’s all cooked and frozen wouldn’t cooking it again in crockpot for 6-8 hrs overcook everything? You can either cook fresh OR freeze raw and cook in a crockpot later. Do you include the liquid ingredients (olive oil and red wine vinegar) to the freezer bag or do you just add those ingredients directly to the crock pot after thawing the freezer bag? Thanks! Either will work, but I add to the bag and freeze. I paid for the cookbook and haven’t received an email to download. I keep getting an email to subscribe. Hi Toni! I’m so sorry about that. I looked up your order and it looks like it was emailed to your “live.com” email address. I just sent new copies there and to the nova.com email address that you submitted with this comment as well. If you don’t receive anything, please email me at kelly@newleafwellness.biz and I’ll make sure they’re sent a different way. Thank you for your purchase, and I apologize for the inconvenience!